Happy Lohri and Makarsankranti to you! When the skin is healthy and flawless up to certain extent, the need for makeup can drastically reduce. Earlier, I had never paid attention to my skin and even if I had taken care of, it will never be the way I wanted it to be, that is free from acne, blemishes and even toned. (Yup, I do have some pigmentation on my jawline and pimples erupting every now and then).I recovered from a huge pimple on the bridge of my nose, yeah the same one that you may see on the bridge of my nose as a darker scar in the photo. :D I hate using concealers so I left it uncovered. 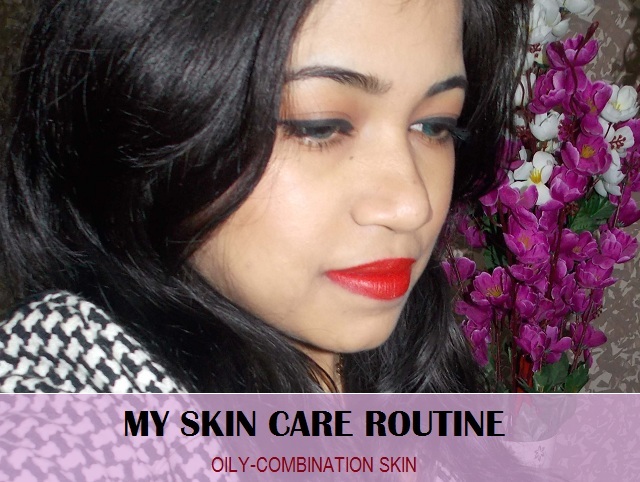 In this post, I will share my oily to combination skin care routine. I am not a genetically blessed person when it comes to good skin, it was just the hit and trials and some extra care that had led to the present state of my skin, which still is not at all flawless but something that makes me go out even without putting foundation. So, for me, this is more than enough. The reason for doing this post is simple that most of us don’t have perfect skin but that doesn’t mean we have to live with that or using extremely costly products. Just the regular care would give good results. Let’s start with the routine and products first, like cleansers, toners etc. I have combination skin therefore, I like to use gel cleansers which doesn’t dry out my skin and removes the extra oils effectively. My favorite gel based cleansers are Neutrogena oil clear face wash, Oriflame Optimals foaming gel cleanser, Jafra Brightening cleanser etc. When you have extra oily skin, naturally you tend to over rub the skin taking off even the essential oils that is required by the skin. Just a light rub with the cleanser should be enough. Once I cleaned my face, I would go for toners, Honestly guys, I tend to skip toners a lot but still would use them when the skin behaves badly. Toners actually tone the skin and maintain the pH balance of the skin. I have liked alcohol free toners like Za true white toner, Oriflame Optimals white Balancing Toner. I also like Aroma magic Aromatic toner (very inexpensive but works good) as it is mild and doesn’t sting or dry out the skin. My current toner is Jafra brightening toner. I am sharing few options since if any you wish to know. So, up till here my skincare routine for day and night is same. For the daytime, I will use a gel based sunscreen as they are non greasy and won’t make me sweat. Those of you out there with oily to combination skin; I will highly recommend gel sunscreen like Lotus herbals gel sunscreen or any light weight matte sunscreen if you have oily to combination skin. After my sunscreen, I would go for a day cream that should be non oily and should not make me shiny disco ball. I like creams like Za true white day cream, Olay fairness day cream, Olay total effects with SPF 20, Jafra day brightener, Lotus herbals whitening brightening day cream, Za perfect Solutions Moisturizer and even Olay moisturising lotion is good for oily combination skin. These are the creams which I find well for oily to combination skin. Now, for the night time, after the cleansing and toning. I will go for a night cream like Garnier wrinkle lift which is my all time favourite as it won’t make me greasy or breakouts, then there is Olay Anti wrinkle cream, L’Oreal Paris 3x laser Anti wrinkle serum, I am currently using Za Restoring Collagen cream which is really good. I won’t brag but I don’t have lines right now, but the motive to use them is prevention at the moment. If you are quite young then instead of the anti aging creams you can use the regular night cream or any moisturiser that is mainly for nourishing the skin and replenish the skin’s moisture. The major difference between anti aging creams and regular creams id the retinols and Alpha Hydroxy Acids which gives a mild exfoliation due to which skin’s elasticity enhances and cell renewal rate increases. There is one more important product that I use only at night and that is an under eye cream. I have used and liked Aroma Magic under eye gel, pure almond oil, Bottega de Lungavita under eye cream. For dark circles, pure almond oil works better than some of the most expensive creams. Next very crucial step is a face exfoliation session. I scrub my face 2-3 times a week. You know when the dead skin cells and sebum blocks the pores, it gives a great breeding place for the bacteria to thrive and create a skin problem. This is why exfoliation is very important for oily combination skin. It prevents skin problems like blackheads, whiteheads and pimples. I also get occasional pimples which I combat with the help of Clindamycin phosphate gel which is an over the counter drug and can be used when the pimple problem is mild, if you’re facing severe pimple problem, I will advise, go to a dermatologist rather than self treating it. I use gel eye mask every 2-3 days at night, while going to sleep as I have puffy eyes and working late and at a stretch in front of the laptop can make eyes get tired and darkness may appear. So, this step is always good. Even if you’re a teenagers or collage goer, do this, it will help relieve your tired eyes. I have faces Canada eye gel mask, which I will keep in the freezer and use whenever I need. This step is also good for people like me who have weak eye sight. So, these were the products in my skin care routine and what I would recommend now comes some of the things which I do to keep the skin in a good condition, actually more than the products these are the things that helps a lot. A glass of water with honey in the morning is a must have for me that cleanses the system. A face mask once a week is also on my list. I would mostly go with a homemade face mask and for that, I will quickly mix a teaspoonful of honey and oats with some milk. This face mask is amazing to exfoliate, nourish and make the skin tone even. When the laziness creeps in, then I will just slather some honey on my face and rinse off after 10 minutes. This is a great way to add a natural glow on the face. Try it and see yourself. Honey is safe to be used for even the most sensitive skin.